Navigation: Home » Investing » A Crucial Part of the Yield Curve Inverted 3/22/2019. What Does it Mean? 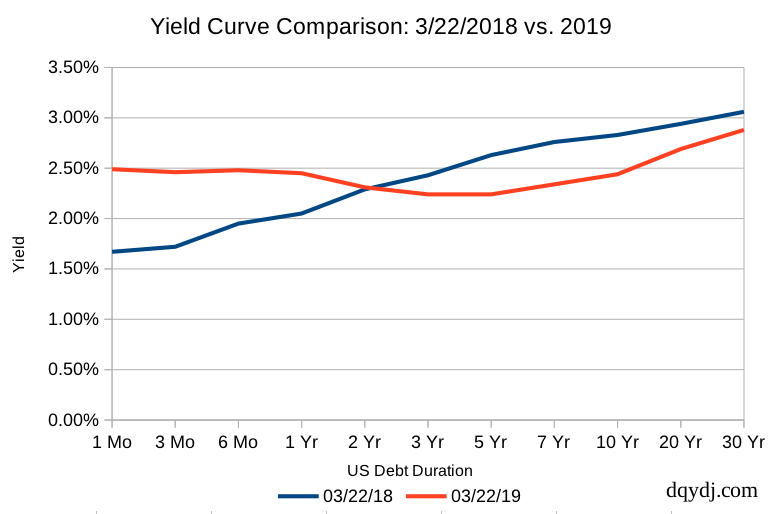 A Crucial Part of the Yield Curve Inverted 3/22/2019. What Does it Mean? The yield curve has been in some type of inversion since December of 2018. In a yield curve inversion, longer dated securities yield less than short term debt. This turns risk on its head – in a well functioning debt market, investors should be paid more to lock up money for a longer time. While we’ve had some varied inversions for the last few months, the most closely watched indicators hadn’t yet gone south. That changed on March 22nd, when the 10 year Treasury’s yield closed below the 3 month Treasury’s yield: 2.44% and 2.46%, respectively. In a previous post we covered the two most closely watched portions of the yield curve – the relationship between 10 year and 2 year Treasuries, and 10 year and 2 month Treasuries. As it turns out, 10s3mos is inverted but 10s2s are still pointing in the right direction with a… 0.13% spread. Every duration of 1 year and under pays more interest than the 10 year. What Does a 10 Year 3 Month Yield Inversion Mean? While the financial press has historically watched the 10s2s difference, there isn’t a huge difference with the 10s3mos in recent years. However, when the San Francisco Fed wrote their summary on 10s3mos, they pointed out that any predictive power from the yield curve comes from inversions. The key takeaway: the last 7 times the yield curve inverted it preceded a recession by between 3 and 15 months. That takes us back to the 1970s. Before the 70s the yield curve’s predictive power was not good unless you checked before the Great Depression. While it’s always possible that “this time is different” and everything is fine, unless you have a convincing theory for “why”… it’s not a good bet. Other countries – such as Italy and (possibly, for the first time in 27 years) Australia have entered recession. Germany and France also appear to be nearing the edge. Additionally, by the strict definition of a bear market, we’re still in a bear. The S&P 500 was down over 20% from its intraday high in December, and hasn’t reclaimed an all-time high since. That’s 182 days of trading below the index’s peak. 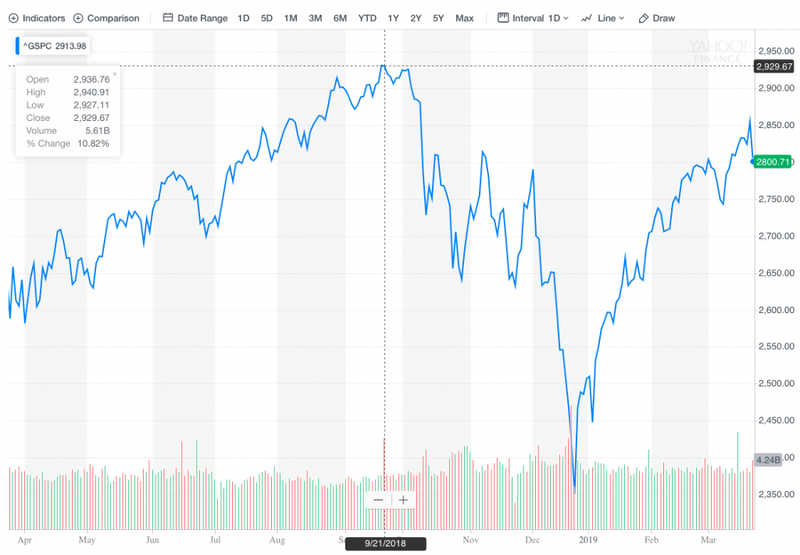 To summarize: by a strict definition, we’re still in a bear market on the S&P 500. The yield curve has been in some form of inversion since 12/03/2018, and the closely watched 10s3mos just joined the rest of the curve. Personally, we’re in a defensive mode. We’re targeting roughly 60% / 40% for our liquid assets: that’s risky assets (e.g. stocks, REITs) vs. safe assets (e.g. cash, CDs, bonds). For our age and situation, most guidance would suggest an allocation closer to 80/20 or even 90/10. The point isn’t market timing. The ideal is to have your portfolio in a position that you’re comfortable with however investments play out from here. If stocks fall 40% and safe assets appreciate 2.5%, 60/40 becomes 47/53 – with plenty of safe assets to reallocate to stocks. How are you approaching the market nowadays? Are you heeding the yield curve warning, or is this time different? What’s your theory? What is interesting that appears to be different this time is —- MMT and the rhetoric I associate with “desperate measures”. The Japanification of the US could be a real thing? In which case, recession is a maybe and slow growth for much, much, much longer is maybe a hair above ‘maybe’? I wouldn’t rule it out completely, but Japan is different in some key ways. Corporate governance is, of course, different – and their overvaluation measured by (admittedly crude) numbers like CAPE suggest 70+ and 100+ spikes in the last 30 years. The USA’s demographics are also primed to be better than Japan too, with more working age folks over the next generation. So… it’s possible, but I wouldn’t bet on a Japan “lost generation of returns” scenarios. I could see a lost decade though, depending on how things play out.